The burn scar effect gel is an easy way to create a fresh burn wound that doesn’t need to be re-used. The package include dry gel powder which when mixed with water creates a gel that simulates the look of severe burns and can be applied anywhere on the body. 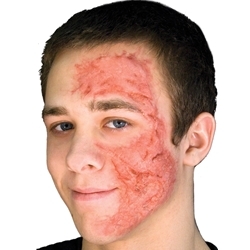 The burn scar effects gel is perfect for triage simulations and other moulage makeup applications. The burn scar effects gel is one time use only. For smaller burns mix only a partial amount of the powder and save the remainder for future use.